It’s part 96 of my youtube countdown, and we are getting so close to the end! 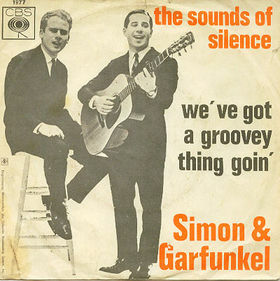 This time I have Simon and Garfunkel’s “The Sounds of Silence,” from the album of the same name. When I was crafting the title of this entry, I noticed that the original version of the song was not titled, “The Sound of Silence,” as I had thought, but was pluralized. Both the plural and singular version of the song are correct however as later releases were known as the “The Sound of Silence.” Paul Simon originally wrote this haunting folk ballad write after John F. Kennedy’s assassination, but the song was not an immediate hit. When the song started to become a hit in the mid 60s, Simon and Garfunkel were no longer working together, but the success of the tune, reworked by producers to give it a more pop sound, reunited the boys and launched them into the mainstream of cultural significance. The live performance I found here reflects the original version of the song with its minimalist beatnik production. In it, the guys are so young and dorky, Garfunkel gives a real proto-hippie moralizing speech, and of course they flawlessly play the song, achieving that perfection they always shot for. Check it out! Powered by WordPress v 5.0. Page in 0.657 seconds.